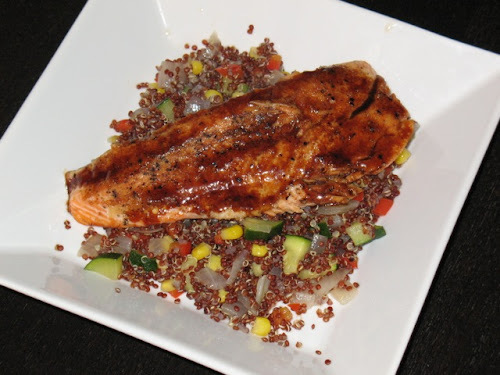 In my continuing quest for good salmon dishes, I came across The Lovely Pantry's Hoisin Salmon with Quinoa and Zucchini. Quinoa is very popular these days, a crunchy whole grain that is supposed to be very good for you. It can be a bit bland on its own, but tossed with other good ingredients it adds wonderful texture. I liked the idea of pairing it with salmon as well as giving an Asian flavor with hoisin sauce. For the quinoa, I decided to turn it into a pilaf, adding sweet onion, red pepper and corn. For the salmon, I switched to broiling, which is my preferred method for cooking salmon, and also added another Asian flavor--fresh ginger. The basil was just because it was hanging around the kitchen, but it went nicely with the quinoa and vegetables. 1. Heat quinoa and chicken broth in a medium (2.5 qt.) saucepan over medium-high heat until mixture boils. Reduce heat to low and cover. Simmer for 10 minutes. 2. While quinoa cooks, in a large (12-inch) frying pan, heat 2 tbsp. olive oil over medium heat. Add onion, zucchini and red pepper and saute for 5 minutes. Add corn and continue sautéing another 10 minutes. Season with seasoned salt and fresh-ground black pepper. Add to quinoa once it has simmered for 10 minutes and continue to simmer another 5-7 minutes until the chicken broth has mostly absorbed. 3. Position oven rack to 4-5 inches from the broiler and heat. Put salmon fillet skin-side down on a rimmed baking sheet sprayed with olive oil. Spray salmon with additional oil and smear grated ginger on flesh side of salmon. Season with seasoned salt and fresh-ground black pepper. Broil for 5 minutes, flip salmon over and broil another 4 minutes. Remove from oven. Discard salmon skin and, if desired, scrape off the grey fatty part. Flip salmon over again so the side with the ginger is up. Put hoisin sauce in a small microwave dish (like a Pyrex ramekin) and heat for 5 seconds to thin it out a bit. Spread over salmon and broil for another minute. Remove from oven and slice in half. 4. Serve a few large spoonfuls of quinoa pilaf in a shallow bowl topped with a piece of broiled salmon and a sprinkling of fresh basil chiffonade (not pictured, because I forgot to add it before the photos, but we ate it!). Thanks so much. The only reason I use red quinoa was to add some more color. I don't think there is much flavor difference. You've really been knocking the salmon dishes out of the park. This was another home run. Thanks. I liked this a lot too. Salmon works so well with many different things: asparagus, greens, grains, beans.